This year, I am still not sure if I felt like I should or if I genuinely wanted to keep the tradition of making the card, but I kept procrastinating. It’s the third holiday season without Ben and I didn’t feel like the card should specifically be a tribute to him. I suppose that a part of me thought that people would also find it strange, and maybe depressing, that I would continue to visibly include him in the card. On the other hand, I was heartsick at his not having a presence in the card. 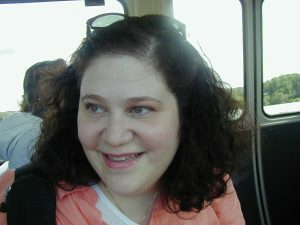 Does grief keep finding new ways to shake up my efforts to forge ahead in life? What I’ve realized is that grief gave me a sort of purpose- it was to share memories of Ben and keep him in everyone’s hearts, which I did when I made the other cards. I wholeheartedly believe that he is watching over me and I want him to know that I honor him in every step that I take. Making my first holiday card that was not a blatant, well thought out tribute to Ben and to us, from only Disney and me, made me feel alone and without purpose. 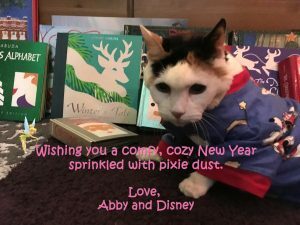 Of course, the memories are always there, and, as I put Disney’s pajamas on her for the picture, I remembered how Ben laughed and commiserated with Disney as the three of us posed for a photo in our matching pajamas. I finally got a picture I liked and wrote a caption. But, this card came with confusion and conflicting emotions because it was not a card about Ben or us. It did not feel right, and yet it also felt appropriate. Which is the voice that I was meant to hear? For so long, my purpose was taking care of Ben. It’s gone on to be sharing memories of him and of caregiving and grief, and that helps me sort through feelings and emotions while it offers insights and maybe, hopefully, comfort to other current and former caregivers. So, who am I without Ben and these experiences? I have gotten back to life. I enjoy my time alone and with friends. I do surround myself with good memories, but I look forward, too. I even started online dating and, difficult as that is, I am trying to be optimistic that I will find love again. New Year’s Eve was never a big deal for Ben and me. We generally stayed in and I cooked a special meal, until he could not eat much anymore. Last year, I went to the movies and an early dinner with a friend, which was not joyous but also not sad. So why has this year gotten me down even more than the prior two years? I guess that trying to make a card with a simple festive greeting and without a message about Ben showed me that I have not yet come into my own. Although I have taken steps towards a new life, it’s hard to face head on that although Ben is always in my heart, I am on my own with an identity independent of him, caregiving and grief. I have established routines and have become more accustomed to life without Ben, but I constantly think about and even talk to him. I’m doing things that I always loved to do, often seeing things through his eyes. I would never have thought that making a card would be such a glaring reminder that I am now doing things just as myself and not as part of the couple that was Ben and Abby. It’s not yet comfortable. I cannot anticipate waves of profound sadness and loneliness, so when they hit me they hit me hard. I have to let the tears fall as they will and I know that I will push through it. 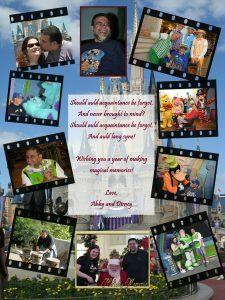 I’m not sure where I go from here in life and love, though, in my Disney way, I am hopeful and optimistic. I hope that in this new year I continue to establish a balance between past, present and future. I read many things from those in grief who wonder where they should be in the grief process and if they are okay. I hope this helps those in grief see that grief is its own journey, experienced at our own paces, filled with memories, insights, reflections and learning that will ultimately propel us forward if and when we let them, when we are ready. It’s not easy, but I find comfort in knowing that Ben and the other loved ones I have lost are somehow guiding me. I wish everyone a new year of love, laughter, peace, good memories and the creation of new ones, and, of course, good health. I don’t actually know where this quote is found- if tv, film or books- but in typical Winnie the Pooh fashion, it is sweet and simple, yet profound, in sentiment. I never forget how lucky I am to have beautiful memories, but I do miss the togethery part. Growing up Jewish, although I dreamed of white Christmases, aside from lovely visits to friends’ homes during the holidays, I did not have my own Christmas until I met Ben. He helped me choose my first real Christmas tree . We chose our ornaments together. He let me decorate the tree by myself because he said he’d never seen anyone get so excited about having and decorating a tree! When Ben was homebound, I had to pick our tree by myself. I admit that despite being very creative, I am not the most visual person. I thought it was a reasonable size. When the man delivered it and put it in the stand, Ben couldn’t stop laughing and just asked, “what did you do?” It was enormous! I called it the tree that almost ate our apartment. That said, it was gorgeous and it lasted very well. We just worked around it! After that, having a real tree became too difficult with all of Ben’s needs and medical supplies. He got me a sparkly pink and silver tree. Of course, I do have all of my Chanukah decorations, too. In my world, they go together beautifully. The lights on the tree are not faring well this year, which makes me sad, because I hate to let go of things that Ben gave me. As Ben’s ALS progressed, I had to be more creative with his gifts. I loved seeing gifts under the tree, but I hated waiting for him to open them. He preferred opening his gifts on Christmas morning, but relented and let me give him a gift on Christmas Eve. Usually, what was supposed to be an exchange of one gift became an exchange of all gifts, with him reminding me that we would have nothing to open in the morning. The child in me didn’t care…until the morning! I tried to find practical gifts with some humor, like a Batman apron so he didn’t have to be covered in napkins when he ate, or a baseball cap with an LED light on the brim to aid us on evening excursions with his scooter. There was one year that he was having many problems with his fingers involuntarily curling. I went to the Gap in search of fingerless gloves and ended up buying three different styles. They were hidden in the closet waiting to be wrapped. One evening, Ben was lamenting his cold hands and describing what he thought he needed. I finally got up, went and got one pair, and gave them to him, confessing that they were one of his gifts. He laughed and tried them on. That prompted another description. I sighed, went back to the closet and came out with a second pair. This made him laugh harder. After that trial and more discussion, I threw up my hands and got the final pair. None of them were completely perfect, but he did not like mittens, which would have been the easiest solution for fit but not for navigation of the scooter. That event became one of our jokes, and on my birthday that year he gave me a charm of mittens from Tiffany & Co. It never fails to make me smile. Yes, Christmas is a remembery sort of holiday. There was the year that Ben broke his foot right before Christmas. Because his mobility was already impaired, he was completely bedbound for recovery and he was devastated. It was understandable- this was a glimpse of what his life was going to be. That night, to cheer him up, instead of waiting for Christmas, I gave him the DVD set of “The Universe” that he wanted so badly. I thought he would like to watch them while he was in bed. Then, to further console him, I pulled out a Monsters, Inc. projectable (sort of a nightlight that projects onto the ceiling) so that he just had to look up and see Sully and Mike. There was a projectable of a haunted mansion in our room at Walt Disney World that Ben loved, so this was my way of recreating that. Finally, I pulled out the photo collage blanket, so he could cover himself in favorite pictures while he could not get to his computer to look at all of his pictures. Of course, by the time Christmas came, there were not as many gifts! 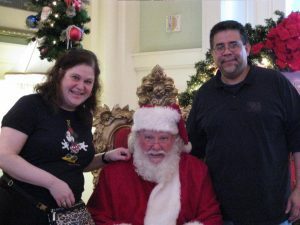 Before ALS, Ben and I were fortunate to spend a Christmas at Walt Disney World. It was my dream and Ben was always happy to go there. It was crazy but it was magnificent, colorful, festive to the hilt and simply magical. Now, with the togethery gone and just the remembery, I do feel lonely. It’s been three years and I never know if those pangs of profound sadness and aloneness should have subsided, but I don’t fight them. I let them run their course and just try to focus more on the good parts, like those I shared here. Of course, I am so grateful for the wonderful, whimsical memories. But, the remembery makes me miss the togethery even more, particularly because Christmas was only really Christmas when my family was Ben. As I was writing this, I realized that Ben gave me a dream come true when he gave me Christmas and that is a forever gift between only us that, in his honor, even if it’s with tears, I must continue to celebrate. Further, being Ben’s caregiver was, in an almost inexplicable way, a gift because it allowed us to share a unique and deeply loving bond that, honestly, was not always easy to see at the time. 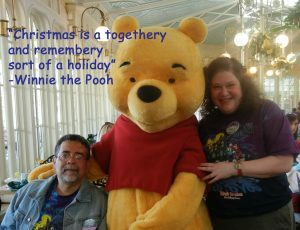 With that thought, I made this video of special memories, mostly from our visit to Walt Disney World in the Christmas of 2007, before ALS came into our lives, and then some photos of Disney and our holiday decorations at home. The photo of us with Disney, all in our matching Mickey Mouse pajamas, was our last Christmas and I am thankful that it was a beautiful Christmas. The video is set to a lovely song, My Gift is You, which is a lesser known original Disney holiday song but is not found in a film. It is on one of my favorite compilation albums, Essential Disney Love Songs as well as on Disney’s Merry Little Christmas. Words and Music by Gary Powell. Performed by Craig Hella Johnson and Leslie Whiteley. I wish everyone a happy and healthy Christmas. At this time of year, family comes strongly into focus and reminds me of how my family has shrunk and changed. Although I love the film, Lilo and Stitch and its messages about family, love, acceptance and grief, I have always been troubled by its very famous quote, “Ohana means family. Family means nobody gets left behind-or forgotten.” Unfortunately, to a large degree, this has not been my experience and that makes me sad. For various reasons, and sometimes on the grounds of religion, there has been conflict in my family, and caregiving for my grandmother amplified our issues after my mom died. I learned the difficult lesson that, with rare exception, aside from my dad, I could not depend on the love of my family to provide the support that was needed. Family let Ben down, too, and usually, it was not something that I could prevent, though I could support him through it. As I have said before, I am eternally grateful for friends who are my family. Caregiving and loss showed Ben and me the people we could genuinely count on and helped us to redefine the notion of family. 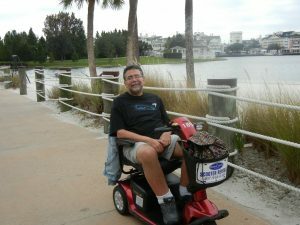 When Ben was diagnosed with ALS, of course there was no question that I would be his caregiver. His family was certainly upset by the diagnosis, and there were many promises made of visiting and helping him. For the most part, those promises did not materialize into actual visits or even regular expressions of concern about how he was doing. He reached out to people and then they usually responded, with what became to him empty proclamations of love and caring, and they rarely took the initiative to reach out to him. It hurt him and frankly, angered and shocked me. Ben was always witness to my devotion to my dad–he listened to our countless daily phone calls, watched me cook and shop for him, visit him on weekends, accompany him to his doctor visits, make follow-up calls to doctors and companies treating his cancer, just as I did for Ben. That was not happening for Ben with his family, with rare exception. There was, however, a lot of drama that was unnecessary, ridiculous, and selfish. I am grateful that while Ben was in the hospital, one of his daughters frequently visited him. She was with him at the end. She and I had a lot of time to talk in those weeks. Now, we are close, and I am grateful to have her, and, also, a direct connection to him, in my life. There were also a few nice surprises along the way, of a few of his family members that expressed genuine caring and concern. We shared a love of Ben and respect for each other that continues today. In my experience, it has been the people who are least involved who have the most opinions and make the most judgments. I will admit that it was, at times, difficult to put aside the drama and just focus on Ben’s needs. Family came to the hospital and talked to him about his going home, getting his hopes up without asking any questions or having realistic information, but with plenty of judgment, especially of me. A friend of his visited and tried to dissuade him from separating from the vent on religious grounds after giving me a hard time about the issue. While visits can be a good time for a caregiver to take a break, I could not leave people alone with him because communication itself was challenging and discussions were often inappropriate and inaccurate. Mostly, they were not a comfort to him. If you are a primary caregiver, if family is not supportive, of course it is hard not to dwell on it. As someone who is emotional, I won’t suggest that you ignore your feelings. So, what can you do? As long as you keep family informed, express needs and set boundaries for what and when you will dispense updates, you will have some level of control of, and grasp of, your caregiving responsibilities and scenario. Family members will have to live with their decisions and you will be able to plan accordingly. It doesn’t mean that you won’t be disappointed or saddened, but you will have a keener understanding of your circumstances and interpersonal relations. This is likely to allow you to detach a little bit as family visits happen, or don’t, drawing attention to the positive aspects of visits (or not) on your caree. For your own self-expression and reflection, things you might consider are: keeping a journal, seeing a therapist, venting to friends, attending a support group or, if it is difficult to arrange to leave home, there are online and phone support groups. But, please don’t lose focus on the important, loving and invaluable work that you are doing for your caree. As I have sorted through the many memories surrounding Ben’s care, I have learned to let go of anger and resentment and I recall incidents more as a matter of fact and sequence than with emotional attachment to the people who let us down. I can look back and feel grateful to have been able to show Ben so much love, though I also wish with all my heart that we never had to go through the experience. If you are a family member of a caree, please be honest with yourself about the relationship that you have had with this person and the caregiver. Be realistic about what you can and are willing to do. If you want to help, ask questions about how you can help and also before judging. Remember that this is not about anyone but the caree, and that the primary caregiver does have the greatest perspective, knowledge and responsibility to the caree. I wrote this post because the holidays are a time that can be so stressful for caregivers and carees, and high tensions can yield high drama. At these times, it is so important to have a clear understanding of the people in your life who are reliable and truly devoted. This does not necessarily mean cutting people off from your life, but rather knowing who will be there to have your back and the back of your caree. Lip service is irrelevant when it comes to a crisis. Ben and I learned that we could not rely on his family. Fortunately, we did have friends who stepped in and helped without needing to be asked. They were not family. Yet, they were. 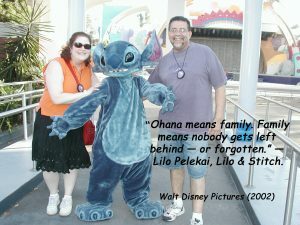 Know who your “ohana” really is because they will not leave you behind. That is something to celebrate. 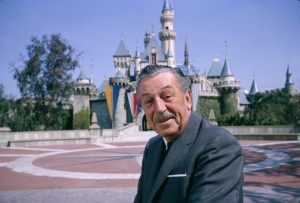 Walt Disney’s legacy lives on so vibrantly and timelessly in so many ways that it’s hard to believe that today, December 15, 2016 marks 51 years since he left this earth. I’m sure it’s no surprise that I love to read about him, and to get a glimpse into his artistic vision and the building of his business enterprises. His belief in himself and commitment to his art are things that we can all learn from. He’s been a part of my life for as long as I remember. I have such vivid memories of my mom talking about her favorite Disney movies and how she loved Mickey Mouse from the time she was a child. She was just a little girl when he was “born.” Mary Poppins was the first movie I ever saw in a theater. It just amazes me how Mickey and his friends touch the hearts of generation after generation. I believe that 50 years from now, and, as Buzz Lightyear would say, “to infinity and beyond,” Walt’s words of wisdom will still stand strong, as will his legacy. 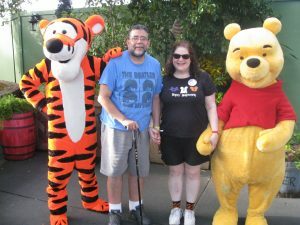 My blog was inspired by the way that I was affected by Disney films, characters and lyrics in light of caregiving and loss. The same can be said about many of the quotes I’ve read by Walt. It seems to me that this is a good day to reflect on some of his words of wisdom that have consoled, guided, intrigued, and entertained me. Now, they are helping me to look to the future with optimism, and I think that’s especially significant as we approach a new year. As someone who still has a lot of my childhood dolls and can’t resist adding new ones to my collection, it is obvious to everyone who knows me that I completely embrace the idea that you need to hold on to your inner child. As I’ve said, my inner child is very much at the forefront of who I am. 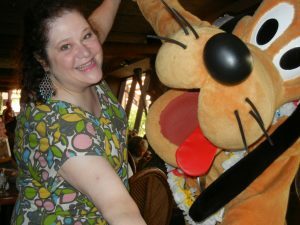 For me, watching a Disney film, and imagining a fairy or fairy godmother at my side, also allowed me to escape the realities of caregiving and loss. 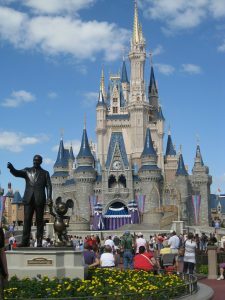 My husband, Ben, always said that he loved Walt Disney World because you simply forgot your problems. 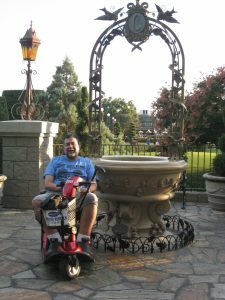 With a diagnosis of ALS, his problems were huge, but immersed in that fantasy land, he was a big kid having a wonderful time, even despite his challenges. For him to be able to feel that sense of joy and excitement was a gift. Walt Disney envisioned and provided that magical setting. I never want to lose the attitude that allows me to step right into the fantasy the way I did with Ben. I never want to stop wishing on stars or forget the wonder and delight that I had as a child. This is absolutely true. Alas, I am a worrier, and I have to work on this, but Walt was right. I can’t say that any of my worrying helped, although perhaps thinking through worst case scenarios may have helped me prepare for a variety of situations. I’ve heard that worrying burns calories, but I’ve seen no indication that this works! I worry now about my future, particularly without much family. But, the worrying isn’t going to affect any change, so it’s time to proceed in the best way I can, and make decisions I feel will help me to create a new life, or, rather, enhance my current one with new love, laughter, joy and peace. I’m going to try harder to listen to Walt on this piece of advice! Grief is tricky. I have taken steps forward, but I cannot predict something will trigger a setback. The reactions people have to grief also vary. Some people expect you to “get over” loss within a designated time period. Some people want you to act like everything is fine, because they are the ones who really cannot handle the emotions. There are even people who think it’s unhealthy to talk about the loved one you’ve lost. I have learned to dismiss those opinions and have gained a bit more confidence in my myself and my ability to embrace the broad spectrum of my emotions. There is more light in my life now, and less guilt about feeling happiness, and I know that the people who love and care for me are glad to see me enjoying life again. But there are also the shadows, and I am not someone who likes to, or can, put on a show of emotions. The good and bad moments are all okay. The Wishing Well at Cinderella’s Castle. We always wished for a cure for ALS. I still hope that wish comes true. 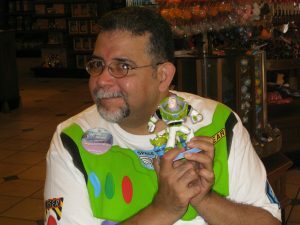 Some people might think that my obsession with all things Disney and talk of pixie dust and wishing on stars is silly. Well, I think silly is just fine (okay, within reason.) I like to think that it is my inner child reminding me of possibilities and letting me believe in my own happy endings. But, just like Walt, I am realistic and I have experienced enough of life to know that things get complicated, and sometimes, downright ugly. In the face of life’s complexities, it helps me to stay positive if I escape for a while into a Disney frame of mind. This quote made me think of Ben and his determination to enjoy life despite ALS. He surrounded himself with music and technology, and he ventured into the world and enjoyed all that he could with a zest for life that, I believe, let him manage the disease well for about four years. It was certainly a good lesson for me. This quote is my current inspiration for the future. I believe that my curiosity, desire to learn, love and compassion will carry me forward to find new and more love, laughter, peace and joy. I cannot deny that right now I feel a bit lost and lonely. At the same time, I feel cautiously optimistic about the exploration. I think that I finally have the strength to summon the courage to follow my dreams. It feels pretty great, and yet a bit scary, to say that. I do believe that pixie dust would help. This is a comfort to me. 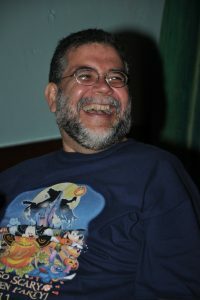 Laughter, imagination, dreams and, of course, love, were the key ingredients in surviving years of caregiving and loss. They have always been there when I needed them, even if, at times, they felt out of reach. This is something to remember always. Never lose hope. Never lose the spark of a dream. That sounds like a good plan! Thank you, Walt!